Innovation and willingness to take risks have a bright future in Colorado, and that future is getting brighter — at least if the latest Kauffman Index report on startup activity is any indication. Colorado is ranked as the No. 4 state with the most startup activity — with 350 people out of every 100,000 adults becoming entrepreneurs each month — up from No. 7 in 2014’s index. Metro Denver also came in high among metro areas, landing the No. 5 spot for startup activity, with 370 people out of every 100,000 adults pursuing entrepreneurship each month. That’s up from the No. 8 spot in the 2014 index. Startup density (the rate at which businesses with employees are created in the economy). Colorado’s and metro Denver’s ranking, the report said, is likely associated with the very high real GDP (gross domestic product) growth it’s experienced. GDP is the monetary value of all finished goods and services produced within a state’s borders during the year. Colorado’s real GDP increased 3.8 percent in 2013, the latest year data are available, according to the Bureau of Labor Statistics. Nationally, 2015 startup activity was higher for 32 out of 50 states compared to 2014. The four other states, besides Colorado, with the most activity are Montana, Wyoming, North Dakota and Vermont. And the four metros besides Denver that have the most startup activity per capita are Austin; Miami; San Jose; and Los Angeles. 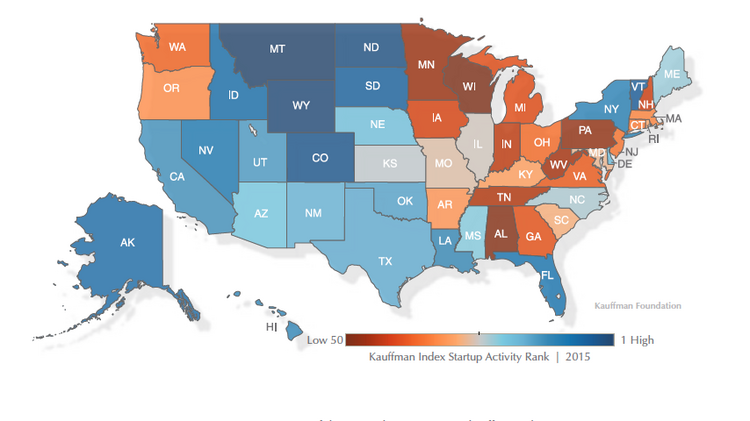 The metro and state index follows the ” 2015 Kauffman Index: Startup Activity,” released May 28, which measured startup activity nationally based on demographics. That report found a major gap between the number of male entrepreneurs — at 63.2 percent — compared to females — at 36.8 percent. The report also found that most entrepreneurs are primarily white, at 59.1 percent, followed by Latino at 22.1 percent, black at 9.2 percent and Asian at 6.8 percent. However, that information could be attributed to the number of Americans, 79.8 percent, considered white (non-Hispanic and Hispanic) according to U.S. Census Bureau data. Interestingly, age doesn’t play a huge role in the likelihood of a person to be an entrepreneur. All age brackets — 20-34; 35-44; 45-54; and 55-64 — all claimed around 25 percent of the total market share of entrepreneurs. People who had at least some college or a college degree were the most likely to be an entrepreneur, at 55.5 percent, followed by high school graduates, at 29.5 percent. Non-veterans overwhelmingly were more likely to be entrepreneurs, at 94.4 percent, compared to veterans at just 5.6 percent. Native-borns are more likely to be entrepreneurs, at 71.5 percent, compared to 28.5 percent entrepreneurs who are immigrants.